The Funeral Cortege for the late Muriel O'Brien-Malone (nee Travers) of Beechboro, formerly of Victoria Park, will arrive at PINNAROO Cemetery on THURSDAY (11.4.2019) for a Cremation Service commencing at 10:30am in East Chapel. 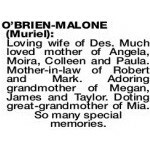 O'BRIEN-MALONE MURIEL Loving wife of Des. 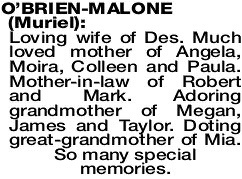 Much loved mother of Angela, Moira, Colleen and Paula. Mother-in-law of Robert and Mark. Adoring grandmother of Megan, James and Taylor. Doting great-grandmother of Mia. So many special memories. 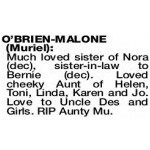 O'BRIEN-MALONE MURIEL Much loved sister of Nora (dec), sister-in-law to Bernie (dec). Loved cheeky Aunt of Helen, Toni, Linda, Karen and Jo. Love to Uncle Des and Girls. RIP Aunty Mu.